The Futatsumori ('Two Forests') family come from a village of the same name in Aomori, near where Ayako's parents Juro and Shizue lived. It's a large village and members of the family still live there, including a cousin who is a local politician. There is a fine bridge nearby which bears the family crest. Juro moved to Tokyo before the war, and served with the Japanese army in China. Ayako's mother's family, the Takahashi's, are from Tokyo. Shizue Takahashi and Juro Futatsumori were married and returned to Aomori in the 1950s where he became a schoolteacher, later the headmaster of a local primary school. He was also a noted kendo master. Shizue had seven children, the eldest being Taeko, who lives in Aomori City; Ayako (1955) being the youngest. Osamu is the oldest brother, but a second brother, Seiko, had a breakdown at the age of 19 and went into a home. He died in July 2007. Of the three other sisters, Junko married an American Seymour Bogitch, who died in the early 1980s. She now lives in Las Vegas near her two children, Ray and Yoko, both of whom are married. Keiko lived for many years in Nagoya but has recently moved back to Aomori. She has a daughter, Akiko, married to Kunio Takeda. Mariko married Nobuo Fukazawa and lives in Yokohama. She has two stepsons, Ku and Yugo and is a noted local artist. Juro died in 1984. 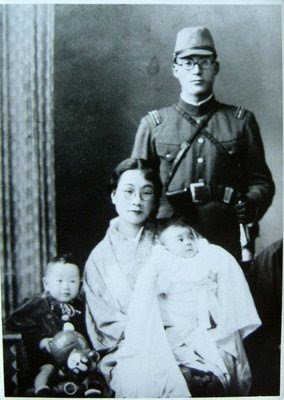 Shizue continued to live in the family house for many years, but went into a home at Shichinohe in 2003, but died at 93. The family house remains open and is used by members of the family when they come and visit.